Do you waste food? Probably. We all do to some extent. But do you waste $1,500 of food per year? According to The Atlantic “…every year, about 40 percent of all food in the U.S. goes uneaten; a typical four-person household discards roughly $1,500 worth” (May 2014). That is staggering! 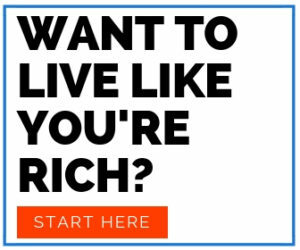 This is not money wasted on stuff you’d at least get to enjoy–like cable, restaurants, or dog costumes. Nay, gentle reader, this is money literally thrown down the garbage chute! I was shocked, SHOCKED, I tell you. 2) Grocery shop with a list. 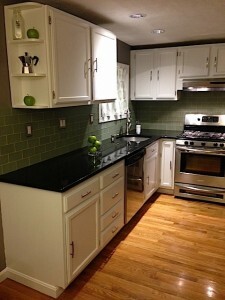 3) Create your grocery list in your kitchen. 5) Ignore coupons and sales. 6) Eat the same meals on repeat. 7) Eat leftovers until they’re gone. Or freeze them. 9) Eschew traditional meal conventions. 10) Conduct food freshness scans throughout the week. 11) Food does not expire. What about you? How do you say no to food waste? Which food is the biggest culprit for waste in your kitchen? The point of origin for food waste is the grocery store (or market, or produce stand, or bodega). Especially if you shop while hungry, without a list, and in the evening after a glass of wine (not that I’ve ever done this…). Thus, the first step is to not buy too much food. This is seems really obvious, but, Mr. FW and I were 100% guilty of what I like to call “optimistic purchasing.” Especially in the produce aisle. While it felt really noble to buy 10 pounds of raw kale, were we really going to eat kale 15 ways all week? Heck no, people! That kale went in the freaking trash! Now, I’m the frugal weirdo separating banana bunches to get the exact number we need for the week. I literally do not buy a single extra banana. Yeah, yeah, I know everyone says to do this. Know why? Because it works. Mr. Frugalwoods and I know what we’re going to eat for every single meal all week long before we ever step foot in the grocery store. A doubly wise idea for us given our mistaken for through-hikers in a grocery store incident. Unless they’re for things you explicitly need. Again, that 10 pounds of kale is not a good deal if you’re only going to eat half a pound and toss the rest. 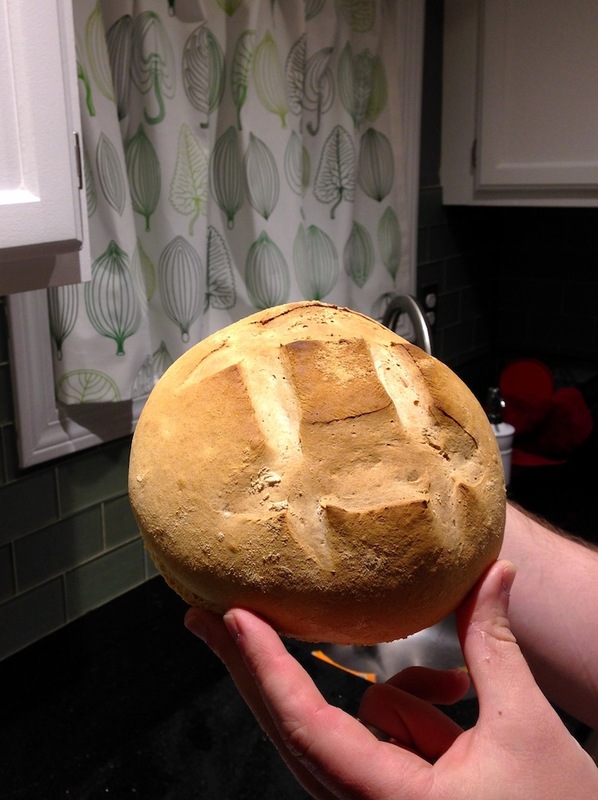 Mr. FW shows off his homemade artisan boule! It tasted amazing and cost pennies to bake. Buying in bulk is absolutely the cheapest option, but since there are only two of us eating (Frugal Hound and her kibble are an entirely different story), we have to repeat meals in order to use up everything we buy. Every Sunday, Mr. Frugalwoods cooks a gigantic batch of rice and beans with mushrooms for us to take for our work lunches all week. This is a triple frugal score: it’s dirt cheap (circa .20 cents per serving), it uses bulk ingredients, and since it’s made in advance, we’re guaranteed to take our lunches to work every day. Ya’ll, this is non-negotiable. Since we’ve already purchased the food and Mr. FW has gone to the trouble to cook it, we eat every meal until it’s all gone. If you’d rather freeze part of a large batch, go for it. My mom is a big fan of the freezer method and it works well for her and my dad. Mr. FW and I prefer to eat the food in the moment because we’ve already paid for it and it doesn’t make sense to us to save it for the future, especially when there’s the possibility it won’t survive life in the freezer. Newsflash: it goes bad fast. Real fast. When in doubt, eat it. Homemade guacamole by Mr. FW. 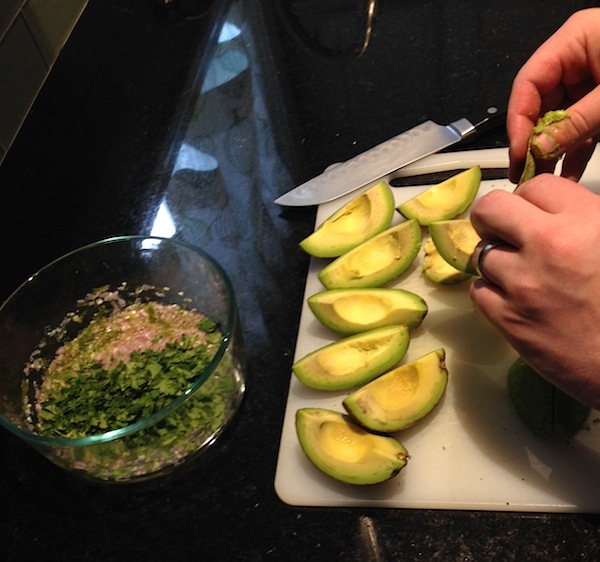 Those avocados were on the brink of turning brown! 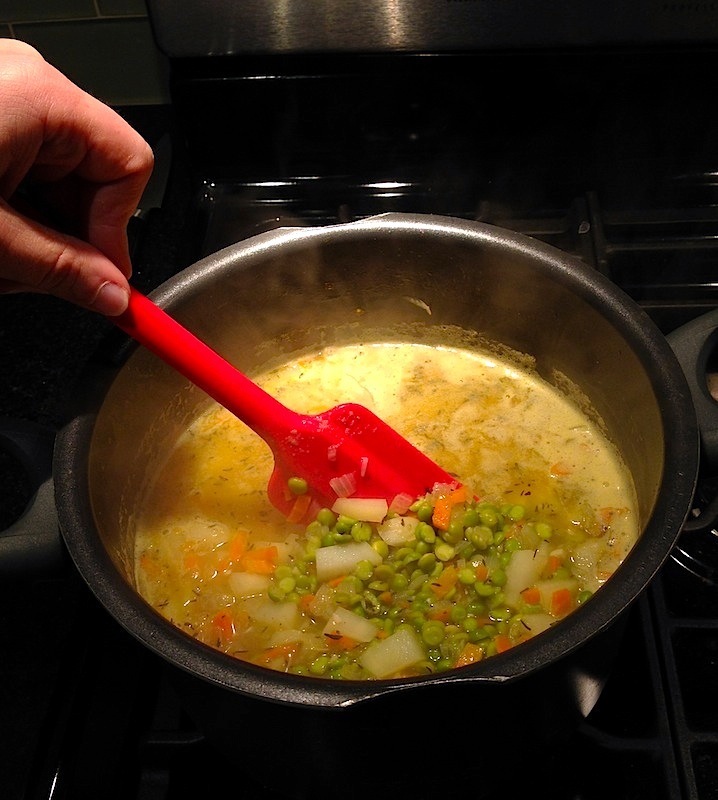 Mr. FW stirs his homemade split pea soup. A great repository for any produce that’s wilting! Don’t be caught off guard by stinking salad or mouldering mangos. I scan the fridge every day to make sure we’re eating food in the order it needs to be eaten. When we spot a foodstuff on the verge of death, it becomes part of our next meal, no questions asked. Ok, it does expire eventually, but for the most part, you can get away with eating things long after their expiration dates. Those dates are extraordinarily conservative. We instead employ the sniff test. If something sniffs fine, we take a small bite. If it tastes fine, we eat it! I also pay close attention to expiration dates when purchasing–later dates can often be found on inventory on the back of the shelf. Yes, I do in fact paw through all of the spinach bags to find the latest expiration date. Basically I’m a menace in the produce aisle. Our resident chef, aka Mr. Frugalwoods, is a huge proponent of what he calls “glue food.” Glue food involves a base ingredient such as rice, quinoa, or pasta plus anything perishable chopped up with garlic, shallots, and hot sauce. When in doubt, add hot sauce. Good times. .10 cent oats with strawberries that were deteriorating. Once we hit 5-6 days post grocery store, it’s time for a glue foods dinner! This ensures that every last scrap of food is eaten and, it results in some really tasty, if a bit unusual, combinations. 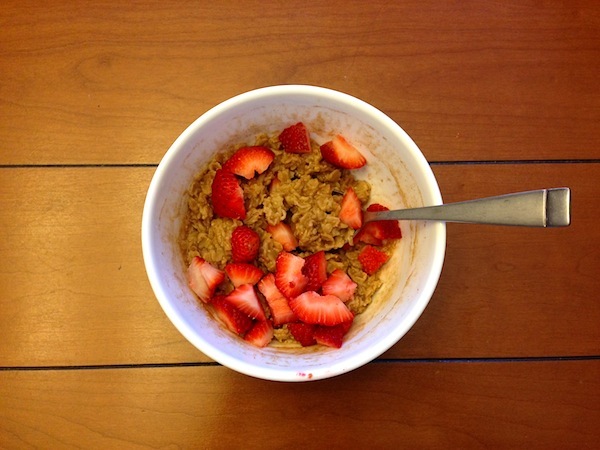 For fruits, our morning oatmeal (which is .10 cents a serving) is the ultimate catch-all. Fruit that’s going soft tastes divine when mixed into oatmeal! It’s not just our wallets that are hurting, though: between the energy that’s used growing and transporting crops and the methane gas released by rotting food in landfills, food waste is responsible for emitting the equivalent of 3.5 billion metric tons of carbon dioxide annually. If food waste were a country, it’d be the third-largest greenhouse-gas emitter on the planet, after China and the U.S.
Dang! Once Mr. FW and I got into the routine of not wasting food, it became second nature. We’ve put our lives on frugal autopilot and avoiding food waste is a crucial element. One of the biggest food waste reducers we do is not cooking something new until the leftovers from the last batch have been completely consumed. The new will be too tempting next to the batch that was made days before and you already ate 3 or 4 times. If all else fails, freeze what is left and eat it in a couple of weeks. I’m also really big into making my own broths now using veggie scraps and a tiny bit of olive oil. So much cheaper than buying broth and healthier than bullion cubes, too! That’s a great system, we usually do that as well. We just eat the leftovers until they’re gone! Good call on making your own broth–clever! I am completely agree with the entire POST!!! We really struggle to get things like cilantro eaten when we may have bought it for a recipe that calls for a couple tablespoons but the bunch you buy in the store is much bigger than that. I’m planning to remedy this problem next year by trying to grow my own cilantro- Im pretty sure I’d waste less if I grew it at home and only needed to pick out the amount needed every time! Growing your own is a perfect solution. Like you said, then you can just harvest the exact quantity you need. I am not an inspired chef – if I’m not following a recipe, chances are that the result is inedible. 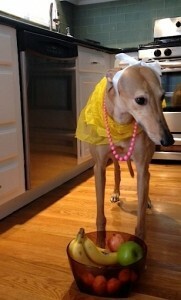 I totally admire your ability to see what needs to be used, toss it all up, and have an edible dinner!! You have so much to juggle, Kirsten, I don’t know how you do it all! It’s so tough to have a spouse out of town–throws off the whole system. We hated it when Mr. FW and I both traveled a lot for work; not our finest years those. I batch cook my lunches and suppers. I live alone and I’d surely waste more food if I didn’t. I still waste the occasional bit of optimistically purchased produce. I avoid the fresh stuff at times so it doesn’t end up in the garbage. I use a lot of canned veggies in my batch cooking. I also split the bunches of bananas. People often comment on my fridge being so empty. But this helps me see what I’ve purchased (nothing rots in the back and smells) and it means I’m not purchasing more than I can eat before it goes bad. Right there with you on the empty fridge! Ours is positively spartan by the end of the week. It sounds so simple, but it’s a great system–like you said, makes it really easy to see what’s going bad and needs to be eaten. I have my own trash compactor husband– he would eat the neighbor’s leftovers if i let him. It’s awesome because nothing goes to waste in our house, but he gets all the credit for it. We’ve found that just about any leftover imaginable can be thrown into either smoothies, quiche, chili, or homemade pizza. Absolutely! Those are all great repositories for aging food. I love a good mixed-up stew/chili/soup. Makes it interesting and you can just keep throwing stuff in! WOW. Now that’s a good way to use cilantro. Because the bunch is always too big. Awesome post, Mrs. FW. We follow these same rules. Even expired food can be “repurposed”. Rotten bananas make great banana bread, for instance. And so much of it is simply not being picky. Eat the food b/c it’s in the house and it needs to be eaten or it will go bad, ignoring what you WANT to eat and simply being grateful that you have food. Amen! Love this: if it’s in your house, EAT IT :). I can’t believe I forgot to mention banana bread! I have a bag of bananas in the freezer that I pull from for banana breads periodically, a trick I learned from my mom. This is something I have been working on and making great progress this year. I learned to my biggest one is number 8. As far as expiration dates you are correct. Those dates are mostly for retail and standard base dates. Doesn’t mean the food is automatically expired. Majority of retailers remove the items dates before they expiration dates and “damaged” them out. Majority of my groceries come from a liquidator store where you find great food for dirt cheap price. So true about the expiration dates! And, good call on getting food from a liquidator store–wish I had one of those near me. I second the smoothies or stir fry. You can use up just about anything. Our one thing that does go bad sometimes is lettuce. I don’t think you can freeze it and I can’t really make soup out of it. Fresh greens are always tough. I take a salad of greens to work everyday and some days it’s a gigantic salad (if I’m trying to use up the dying greens) and other days it’s a lot smaller if I’m trying to make the greens last longer :). i take a head of romaine, chop down to the core (save this in the freezer for stock), put it in my salad spinner, fill the spinner part way with water and wash the chopped leaves under the water (so much faster this way), then dump out the water, spin the lettuce, dump out any excess, and keep it stored in the fridge in the salad spinner. any excess water drops to the bottom of the spinner and the lettuce stays fresh much longer, while being easy to grab and already washed/chopped up! try it. it works! Love this post. With a family of five food waste is a constant battle for us. Since we make trips to the store at least once a week, we have learned o cut back on the amount of food we buy to try and avoid waste. We always shop with a list. We Freeze leftovers and unused fresh fruits to keep them longer. If you core and cut in chunks you can use in smoothies. I’m pretty good about not wasting food, but what I’m not good about is my grocery budget overall. Aside from a few specialty items I’m trying to five up (like kombucha, pb2, store bought hummus), I buy lean cuts of protein which costs more because for me eating rice, beans, and pasta is a sure fire way for me to gain weight at 44. And I must admit as much as I’ve tried, I just can’t get into quinoa. I’ve tried! 🙂 So at least I have one side of the problem tackled, not I’m just trying to work on the other side of reducing my bill AND eating food that is right for me! Hey Tonya . I hear you on quinoa we are trying to eat healthier and we also have to make sure the kids will eat it. Had a few failed attempts when we tried to substitute it for our rice in a dish. It was too much and meh. But last night I think we had a success! We cook it up and threw it in as a salad topping. So you get the goodness and palette wise it was good as it was part of a medley of flavor in the salad. I recommend you give it a try that way. The glue food was great new advice! Only hiccup is making sure there is plenty healthy food for kids to eat(snack on) and dealing with the fact that someone is not a fan of eating the same thing all week. Tonya–I hear you on avoiding pasta. We limit our bread/pasta consumption (for the most part) to the weekend for our treat meals. We eat a lot of beans, which we’ve found to be a pretty good lean protein. And when we do eat meat, the frozen wild caught salmon at Costco is a good deal. The Roamer–yeah, we’ve just become accustomed to eating the same thing multiple days in a row, but I know it’s tough to get used to for sure! That’s a great strategy! Hard to waste food if you don’t have very much of it on hand at any one time. Great tips!! A big changer for our grocery bills was when we started creating the shopping list from the kitchen and double checking what we had before we left the house. We had a period of time where we had 5-6 boxes of the same thing and they were only wasting our money. It takes a few minutes to confirm what you have before you put it on the list. That used to be us too! It really does pay to make the list while looking at your pantry. Do you have any tips for keeping my fiance’s appetite down? 😉 While he is in the garbage disposal of men club, he also eats a lot, and that’s what ultimately ends up getting us. No leftovers, and he’ll sometimes still be hungry after dinner. Thankfully, I don’t eat much, so it balances out, but I wish that could be changed! As far as making the list in the kitchen – yes. My mom and I used to team up and she would go through everything, and I would write down what we needed. Hah! The garbage disposal of men club! Could you get some cheap “fillers” for him? Like homemade popcorn or carrots? Or maybe try sending him to the neighbors for their leftovers ;). I’ve slightly shifted our buying habits to pretty much match what you’ve written here exactly, mostly by starting to meal plan (we were already batch cooking) and only buying what is needed for the plan. My husband doesn’t like that there isn’t extra food around for snacking! I still buy it for him if he puts it on the list, but it has to be on the list. 🙂 I find the meal planning to be very stressful, though. No spare food! I like it! Our meal planning is kinda lazy… we just pretty much eat the same stuff every week. Boring I know, but it is easy, cheap, and not very time consuming. We shake it up on the weekends, but M-F is pretty rote at this point. I always feel pressure to buy what’s in season, but that really only happens when we have our CSA and not so much when it means I have to wake up early to get to the farmer’s market. But we do change things week-to-week for that reason. I’m pretty good with eating the same thing for weeks on end! Agreed on the leftovers–I’ve never understood that at all! I have to chime in here. I was at my brother’s house one night. He has a wife and two young sons (9YO & 12YO). The wife was very proud to tell me that she made black beans from scratch (meaning with dried beans and not canned) and the family had eaten black bean tacos for dinner the night before. She said she had cooked a whole bag of beans and had to give the leftover cooked beans to a friend because she didn’t know what to do with them. Five minutes later, I managed to pick my jaw up off the floor because cooked black beans IMO are the most versatile food ever. They can be mixed with almost anything and eaten for breakfast, lunch, or dinner. I have put some in a smoothie before even. She claimed “my family just won’t eat leftovers” and I was speechless for the rest of the night I think. I eat “leftovers” everyday for lunch! Sometimes even for dinner! Leftovers is good food! Who has time to cook dinner every night? And who has money to go to restaurant every other night? My brother’s family, I guess! We were great at not wasting food at our house (except maybe the rice or flour that got grain bugs in it. No way we were eating that!). But living with my mom, it’s driving both of us nuts. My brother buys his own groceries, and occasionally my mom does too. But we sometimes have no clue who food belongs to – my husband has to ask if those apples in the fridge were ours or my mom’s. We buy all the food for dinners and our breakfasts and lunches, but mom’s on her own. We’ll find rotting food in her produce drawers, and have no clue when she bought something. And she complains that there’s no room in her freezer (there isn’t), but I never see her take anything out of it except popsicles! Ack! Sounds like my worst food nightmare ;)! But, I suppose it’s only temporary, so that’s a good thing. We’re very similar. We also only spend about $300 on groceries a month, but we eat meat and dairy (not too often, though). We always have left-overs and Kate is always trying to find if you can eat things that most people assume is garbage, like butternut squash seeds and turnip greens. It turns out you can eat everything. Shopping every week is definitely key for us. Very cool about the uncommonly eaten foods–sounds like a great way to save money! This is an area that I needed to improve dramatically after college. Meal planning alone for me has made the biggest difference as I do the meal planning at home to try to use up anything open as to not goto waste. Has there been waste still? Yes… I typically do not use an entire bunch of cilantro. I don’t use all of my milk before expiration (if you know a good / cheap milk substitute for cooking, I am interested). And a few other randoms, maybe a potato or two, probably a little kale. But this list is solid and it is what everyone should try to follow to be frugal with their grocery shopping as well as avoid waste. Well for example waffles yesterday, my wife is planning on making some pudding thing tonight. Another item is cheese chowder we use milk in that… there is always something every week it seems where we use a little. Maybe for cooking I could just mix dry milk powder with water? I use that for making bread, I will have to compare cost. You can freeze milk fyi. If you only use it in small batches, freeze it in ice cube trays and you can transfer to a freezer bag after (same with wine for cooking). I second freezing milk. I do it all the time. It’s still good for cooking, having in coffee, etc., after thawing. I usually freeze it in small glass bottles or pint-sized mason jars. If you don’t wait until very close to the expiration date before freezing it, it will stay good for several days after thawing. I keep the bottle/jar in the fridge after thawing and use milk from there until it’s gone and it’s time to either thaw another or buy a new bottle of milk. We use a very similar process!! I probably eat a little more meat than you but I am OVER wasting money on food and the concept of food waste in general. It makes me crazy from a money and a social perspective. There are people who are hungry out there!! So, I am very intentional about how I use my food stuffs. You have some really good advice here, though I have to disagree about coupons and deals. Yes, some people will end up buying things they don’t need and will end up wasting them. But not everyone will overbuy due to coupons and sales, and it can save you thousands over the course of just a few years. That’s a good point–coupons can certainly be used wisely and well. And, a coupon for something you already need is fabulous! I feel pretty proud that we do the majority of the things on this list 🙂 we sometimes use coupons but they’re not as readily available in the UK as they appear to be in the US. I’ve gotten a lot better about not wasting food, for the most part. I occassionally find that something got shoved to the back of the fridge and is now growing on it’s own, but for the most part I don’t waste much. Last week I made a stew out of the last of my celery that was getting kind of flexible/bendy, a few carrots that were looking a bit old and dry, and an onion that I had to cut a small chunk out of to make edible (had a bad spot) and some ground beef I had leftover. Throw in some broth and spices = yum! Great tips here Mrs. FW! I just started putting all of my scrap veggies in a bag in the freezer. After I’ve got a full bag, I plan on make vegetable broth. That’s a good idea. Anything that can serve to use up scraps of veg is key! Awesome advice, and we implement most of these at home (which leads to near-zero waste every month). So we might have leftovers and they grumble and mumble about not liking it. Sometimes I relent, and sometimes I get creative and rebrand leftovers as something else with a new added ingredient. Like pasta and sauce becoming pasta and sauce with hotdogs and leftover peas on top. If I don’t get the occasional complaint from the kids, then I know I’m not optimizing enough. 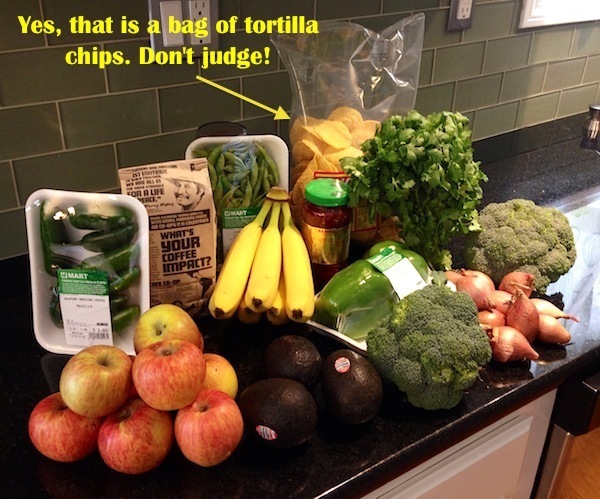 So…do you go through an entire jar of Sriracha every week since I see it snuggled so comfortably in your “typical weekly grocery haul” photo. If that’s true, then you guys have just gone way up in awesomeness in my book! Sharp eyes! Funny story: yes, we were using a jar about every week/two weeks! And so, we actually bought a gigantic jar of it since it was vastly cheaper in restaurant quantity :). I have a photo of it on our blog somewhere… it’s seriously the biggest container I’ve ever purchased food in. All of this is great advice. We are pretty good about this. Ironically, when we have wasted food it is when my wife defrosts some kind of meat and we don’t cook it in the few days defrosted and we have to potentially throw it out. Like right now we have some stew meat defrosting in our fridge. Hopefully, we can put it in the crock pot later tonight. Or translation….Jason needs to learn to cook on a larger scale (but my wife is the greatest chef in the world). We aren’t as good as y’all are, but we are getting there. And salsa can also help a lot of meals! It is, afterall, America’s #1 condiment. You are a wise man to complement your wife’s cooking :), I try to make sure and give Mr. FW props all the time for being our chef. I don’t really know how to cook and so I’d be sunk without him! I’m grateful everyday! We are huge users of hot chili sauce–makes everything tastier. All of this is great advice. We are pretty good about this. Ironically, when we have wasted food it is when my wife defrosts some kind of meat and we don’t cook it in the few days defrosted and we have to potentially throw it out. Like right now we have some stew meat defrosting in our fridge. Hopefully, we can put it in the crock pot later tonight. Or translation….Jason needs to learn to cook on a larger scale (but my wife is the greatest chef in the world). We aren’t as good as y’all are, but we are trying to getthere. Great tips, we’re doing most of these things already. We just had some pork stew from the freezer last night that was frozen about 2 or 3 months ago. That’s awesome that the stew lasted so long in the freezer–nicely done! It’s tough to be sure! For us, once we got into the groove of cooking every meal at home, the temptation to eat out decreased. It really became about habit and routine for us. But before that, it was a huge temptation! I usually buy in bulk too, for me, I can really save a lot by doing that. I go to the grocery store every Saturday and I make sure that I have my list with me. Bulk is the way to go, for sure! Yeah, you have to be careful with Costco. You can save a lot of money, but you have to have a plan for using it! I buy giant packages of cheese, divide them, and freeze, for instance. Costco will give you your money back if something goes bad… but that only solves the wasting of money, not the wasting of food. Good point! We usually don’t buy perishables from Costco. Our bulk purchases are primarily for things with a long shelf life: rice, flour, beans, quinoa, olive oil, dried fruit, etc. I do sometimes buy their produce if it’s in a small quantity. But, definitely have to watch out for gigantic pallets of fresh foods! I admit that I tend to keep experimentation to a minimum. If I buy one thing (like an unfamiliar vegetable) that I’m not sure about, well, I can probably figure it out. If I buy three things like that, chances are I’ll forget about one of them, or just get overwhelmed, and something will go bad before we can eat it. And it sounds simple, but you have to store food properly. I couldn’t believe how long lettuce lasts if you wash it, dry it, wrap it in a dish towel, and stuff the whole thing in a ziploc bag. Like two weeks! It also helps that I often grocery shop by bicycle. Can’t overdo it when you have to fit everything behind the tots in the trailer! Such great points! I totally forgot to mention proper food storage–thank you for bringing it up! We usually go to the grocery store on foot or by bike, which absolutely limits our purchases. We do drive to Costco, but I know there are folks who do Costco by bike too. I’m one of those annoying people that would much rather eat the same meals on repeat for the sheer sake of convenience than have to rotate through meals and always wonder what to make next. I don’t get sick of things like many other people do. I’m right there with you. I don’t mind eating the same thing every day one bit. It’s easy, cheap, fast, and healthy. Hard to go wrong! Our meals are usually for 2 or more nights by design. Leftovers are a norm in my household. When I grill it is definitely a multi-night meal. Any leftovers that go beyond one day are frozen. As I don’t mind left overs but I wouldn’t want to eat the same thing 3 or more days in a row. We do have a food waste problem with bread. It usually goes moldy before we can finish a loaf. Bread actually freezes pretty well. We bake our own bread now, but when we bought loaves, we’d often freeze half the loaf right away. Now, Mr. FW just bakes small loaves of bread that we eat up in just a few days. So many great tips here, Ms. FrugalWoods! I wholeheartedly agree with all except one — ignore coupons and sales? No! I always look for what produce is on sale (legitimately a good deal, not just a “sale” in name only) and build meals around that for the week. I’m a single gal, so my cooking strategy generally is to cook four servings at a time. Then, I either have four meals ready for myself or split them with my mom so we each have two. She does the same. It’s a rather nice trade! Very good point about legit sales–those are worthwhile for sure! And, sounds like you have a great system with swapping meals with your mom. Yum! I love that you guys do the sniff test! My husband thinks I’m nuts, but like I always tell him: No one tells the milk, “hey you’re supposed to expire today!” ANd a little sour milkl never hurt anyone..
Ugh, we have been just TERRIBLE with food waste lately. And not to pass the buck, but it is my partner’s fault! He is unemployed and thus in charge of all things at home. Rargh. Oh no! It’s a tough habit to get into. I find that doing the refrigerator audit is really effective in figuring out what to eat right away. Good luck! Thank you for sharing this great advice, Mrs. Frugalwoods! I already cook in big batches and am thankful that my husband will eat almost anything and for several days in a row. I am guilty of throwing away greens because “optimism.” I know there is kale and lettuce in the fridge whose days are numbered as I write this…. Great post! I’d love to know how your husband cooks his rice and beans with mushrooms. Sounds like it would be an awesome lunch to take to work. Thanks! I follow your blog and LOVE IT. Started at the beginning and have found myself in November. Would you consider posting the rice/bean/mushroom recipe that you mentioned in this post? Also, would love for Mr. Frugalwoods to post some of the many yummy recipes you mention. Many thanks and keep up the great work!!!! Love this post and your blog! It’s by far the best and most comprehensive frugal blog site I’ve come across. I especially can relate to #10. I also would also add that sometimes I go without weekly shopping (except for essentials like milk and a few fruits and veggies) by simply eating out of our pantry or freezer since I do alot of bulk shopping and freeze ahead meals. This way I use what I already have on hand before it expires and thereby save time and money . Thanks again for your wonderful blog and keep up the great work! Thank you Mrs FW for the nifty post. I think you are right, we all need to stop wasting so much food. My bad one is cilantro, I buy it to make spring rolls or salsa, then am working a lot and too tired to cook. 3 days later the cilantro is kaputt. Lately I have been freezing some…. 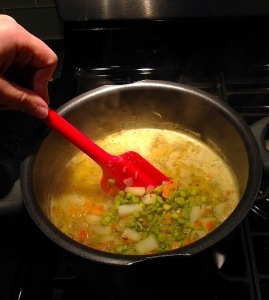 I have however done a lot of using what i am buying, sometimes we make pasta salad or soup with leftovers…. sometimes if no other way, the chickens or the dogs get it, last resort is my compost pile. Late commenting, but it’s easy to keep cilantro longer! Instead of leaving it lying in the plastic bag, trim the bottom 1/2 inch off the bundle of stems, and stand the bunch up in a tall glass partially filled with water (just enough to cover the bottom of the stems, not any leaves: trim out any leaves near the bottom and just use those first 🙂 ). This way it lasts a really long time: easily 1-2 weeks. What a great article. I clean my fridge weekly but will start checking it more often. To me, wasting food is like getting a big fat F on your frugal and domestic goddess report card. Fortunately my parents used to say “It’s a sin to waste food” so I was well trained. I already plan meals but I need to plan them from the kitchen. I rarely throw things away but I have too many stores in the pantry so need to ‘eat them down”. Thanks again for all the awesome tips.